Connor McLenna’s early goal gave the Dons a deserved interval lead but second half goals from Sean Clare and Uche Ikpeazu gave the Jambos victory. The Dons drop to fourth as a result of the defeat with Hearts moving to within two points of Derek McInnes’s side. Dons boss Derek McInnes made two changes for the trip to Tynecastle with Michael Devlin and Stevie May, who started the 1-1 draw with Livingston before the international break, dropping to the bench. Andy Considine and Greg Stewart were their replacements in the starting line-up. The Dons started the game in strong style and their impressive opening was rewarded with the opening goal in the 15th minute. Sam Cosgrove rose highest to meet Niall McGinn’s corner, only to see his header come back off the crossbar but Connor McLennan reacted quickest to head the ball into the net to make it 1-0 to the Dons. 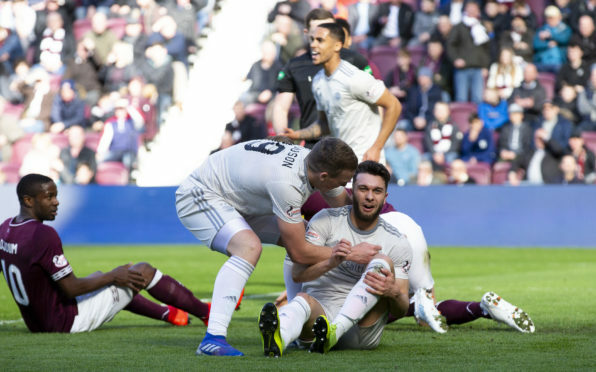 Hearts huffed and puffed without putting Dons goalkeeper Joe Lewis under any pressure and the visitors could have added to their lead in the closing minutes of the first half. Cosgrove saw another header tipped over the crossbar by Zdenek Zlamal before Dons skipper Graeme Shinnie’s long range effort was punched away by the Hearts goalkeeper. Aberdeen would come to rue those missed chances as Hearts equalised on the hour mark. The goal came from the penalty spot, awarded after Jake Mulraney had been tripped by Lewis Ferguson, and Sean Clare sent Joe Lewis the wrong way to make it 1-1. Hearts had another appeal waved away when Ikpeazu went down under a challenge from Lewis, only to be booked for simulation, but the striker’s perseverance paid off as he scored a second for Hearts with 15 minutes remaining. Considine and Scott McKenna both fail.ed to deal with a long ball forward and their errors were punished as Ikpeazu found himself one on one with Lewis and he calmly slotted the ball past Lewis for the winner.